This month’s round-up of the latest age-defying strategies. Strange as it may seem, if you’re lucky enough to be offered a seat on the train or the bus, you may want to refuse – politely, of course! When we sit, we experience of fewer muscle contractions, which are vital for clearing glucose and fats from the bloodstream. ‘It’s critical for people to reduce their sitting time,’ say the authors of a new survey at the University of Sydney. The research revealed that adults aged 45 and over who sat for more than 11 hours a day had a 40% increased risk of dying within three years compared with those who sat for fewer than four hours a day. So here are five suggestions to get you on your feet. · Hide the TV remote. · Stand on your daily commute – it’s not so bad if you read a good book! · Combine TV watching with an active task, such as ironing. · If you drive to work, find a parking spot a few minutes’ walk away. · Give yourself regular screen breaks and get out of your office chair. Hot flushes are an unpleasant menopause symptom and can be an embarrassing age giveaway. Around 80% of women experience these in the run-up to the change, which can start in your mid-40s. Synthetic estrogen in HRT can help, but there are also herbal remedies that contain compounds with a similar chemical structure to estrogen. Black cohosh, ginko biloba, ginseng, sage and red clover all contain these phytoestrogens, which are also found in lentils, chickpeas and broad beans. 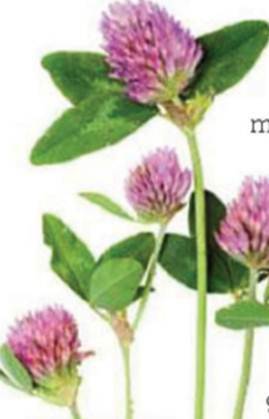 In a new trial, Double Strength Promensil ($38.5 for 30 tablets, Boots), which contains red clover, reduced flushes by up to 75%.